I enjoyed this year’s ECCMID in Barcelona very much, and came away feeling scientifically, culturally and culinarily enriched! Many thanks to the organizers for such a broad and interesting programme. One of the most interesting sessions was the very final session, on controlling MDROs in the ICU. The session boiled down to the pros and cons of three approaches to decolonization: selective digestive decontamination (SDD), mupirocin for MRSA nasal decolonization, and chlorhexidine gluconate (CHG) bathing. The faculty of Dr Brun-Buisson, Dr Harbarth, Dr Bonten and Dr Huang made it an engaging session. The problem is antibiotic resistant bacteria, particularly in the ICU. Is the solution really indiscriminate use of antibiotics to temporarily suppress the load of antibiotic resistant bacteria in the gut? It doesn’t make a lot of sense to me either. The use of antibiotics leads to antibiotic resistance, sooner or later. A number of studies suggest that SD is not associated with an increased overall prevalence of resistant bacteria (not least the impressive Daneman review). Indeed, one study showed that rates of resistance actually decreased on units using SD. However, these studies conflate the potential for reducing transmission (and hence reducing unit-level prevalence) with the risk of selecting resistant sub-populations, which both seem likely. One particular concern is the emerging data that SDD drives colistin resistance. Are we playing with fire by overusing our drug of last resort? Furthermore, the abundance of key antibiotic resistance genes doubled on units using SDD when using a microbiotic approach in a recent study. Speaking of the microbiome, another speaker described antibiotics as a ‘microbiome-busing atomic bomb’, so perhaps we should rename SDD as ‘scorched earth decontamination’ (SED)! The importance of a happy, healthy microbiota is beginning to dawn on us. We need to make friends with our microbiome, not obliterate it with unindicated antibiotics. The impressive studies showing the value of SDD have been performed in the Netherlands, which has a low rate of antibiotic resistance. Will SDD be as effective elsewhere, where the background rates of antibiotic resistance are higher? Indeed, the Daneman study showed a notable (although no statistically significant) increase in the prevalence of MRSA on units using SDD. Is this a case of ‘squeezing the MDRO balloon’? SDD temporarily suppresses gut colonization with multidrug-resistant Gram-negative rods but rarely decolonizes permanently. From an infection control viewpoint, it should not change the ‘once positive, always postive’ status quo for resistant Enterobacteriaceae. I appreciate that I’m presenting a polarized and rather one-side case against SDD here. But for me, whether SDD works is the wrong question: is it the right thing to do? If (perish the thought) I’m a patient in the ICU, then SDD works for me. However, if I’m working on an ICU in 2024 wondering what to do with a pan-drug resistant Gram-negative bacterium, SDD (in 2014) doesn’t work for me. Dr Huang presented the key findings from her impressive study of universal CHG combined with MUP. Mupirocin resistance in S. aureus can be low-level mutational) or high-level (acquisition of the Mup resistance genes). The use of MUP has been associated with the development of both high- and low- level resistance. Indeed, several updates from ECCMID show this. For example, Dr Sarah Deeny’s poster showed that low-level resistance appeared to develop during hospitalization. Plus, a study from our group showing that detection of phenotypic high- or low-level mupirocin resistance only represents three quarters of the picture, since carriage of mupirocin resistance determinants remains “silent” 25% of the time. Table: Weighing the pros and cons of universal mupirocin use (reproduced with permission from Dr Huang). One of Dr Huang’s most powerful arguments was that the burden of mupirocin use is in decolonizing a large number of patients prior to elective surgery. Ergo, if you’re going to save MUP, then save it for the highest risk patients (e.g. ICU patients). However, the counter here is that local use of MUP is likely to drive local MUP resistance on the ICU. So, I still feel that we should not recommend the universal use of MUP. Dr Bonden, Dr Huang and Dr Harbarth reviewed the impressive studies that CHG bathing provides strong protective effects against a range of MDROs (for example Climo, Milstone and Vernon studies). These studies are not without their critics – some say that the effect on reducing relatively benign coagulase-negative staphylococci BSI amplifies the overall effect. However, both the data and rationale are stong: if you reduce the amount of MDRO on the patients’ skin (‘source control’), you reduce the chances of endogeneous infection, and transmission to others. 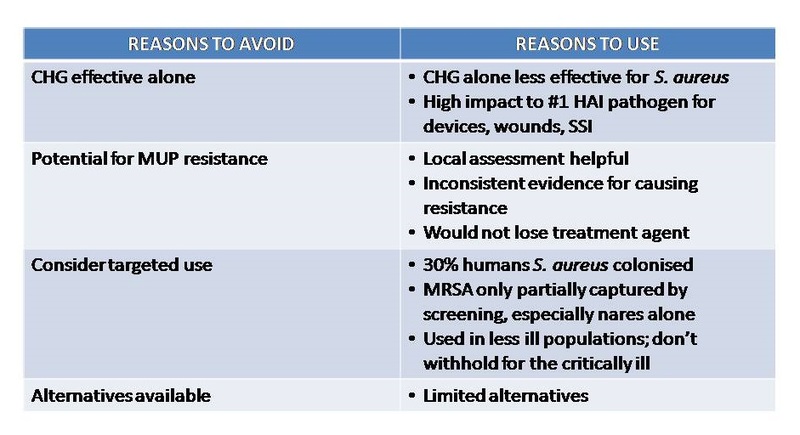 Unlike antibiotics, CHG is a biocide with a less specific molecular target, which makes resistance more challenging from a bacterial viewpoint. However, reduced susceptibility to chlorhexidine must be monitored carefully. A number of studies have hinted that reduced susceptibility to chlorhexide may be an emerging problem, (for example Batra, Otter and Lee.) But increases in bacterial MICs (for Gram-positive bacteria at least) appear to be a long way below the applied concentration. However, it’s worth noting that the measured CHG skin concentration in one study (15-312 mg/L before the daily bath and 78-1250 mg/L after the daily bath) was much lower than the applied CHG concentration (10,000 mg/L). This is around the CHG MIC for some Gram-negatives and potentially brings the subtly reduced susceptibility to CHG reported in MRSA into play. On balance though, the rationale and data on reduced susceptibility are cautionary but not enough to recommend against universal use in the ICU given the clinical upside. What shoud be the standard of care for ICU patients? My current view is: universal CHG, targeted mupirocin for MRSA decolonization and absolutely no SDD! I’ll be posting some blogs on some of these topics over the coming days. You can view some other ‘Perspectives from ECCMID’ here. We are still no closer to figuring out what works to control multidrug resistant Gram-negative rods (including CRE). CDI does not seem to be emerging as a community pathogen, despite apparent increases. Bacteriotherpy for synthetic faecal microbiota transplant (FMT, aka transpoosion) is getting close. We need to stop polluting our plant by pumping antibiotics into our environment. As one tweeter (@marina_manrique) put it, whole genome sequencing (WGS) has becoming a bit like the One Ring from Tolkein’s Lord of the Rings: ‘one ring to rule them all, one ring to bind them, one ring to bring them all, and in the outbreak find them (out – the other methods that is)’. ← What does lab diagnosis of MDR-GNR have to do with SURFing? How do the presenters feel about using 5% PVP-I for targeted or universal nasal decolonization vs. Mupriocin? Like CHG, a biocide vs. an antibiotic. One needs to be wary of persistence of biocides and antibiotics in the nose in case organisms are merely suppressed from growth in the inoculum well of plates or drop below PCR levels of detection. this is nto easy with iodine and is often forgotten in studies. Richard Lacey showed many years ago that blood for example inactivates iodine with a slow time course in operative wounds. one is always impressed that susceptible MRSA recurrs after short suppressive courses of mupirocin – or was it always there above the organisms MIC?